Hi Helmar fans!! It's Tracey back to share a new project with you. Here in the U.S. we're celebrating the 4th of July next week. 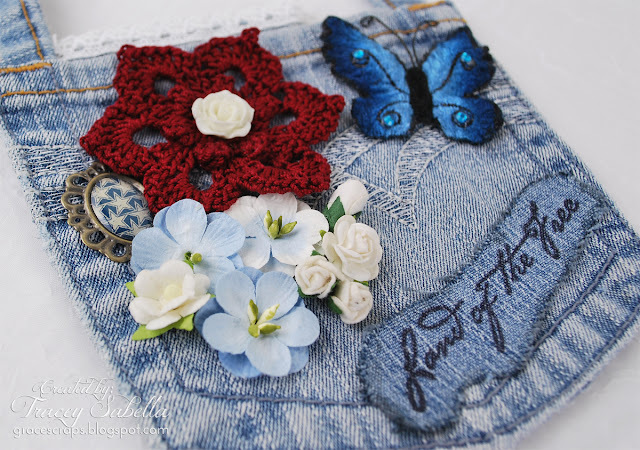 I've made a no-sew home decor piece by recycling an old pair of well worn jeans for my Patriotic Door Hanger featuring Helmar Fabric Glue. 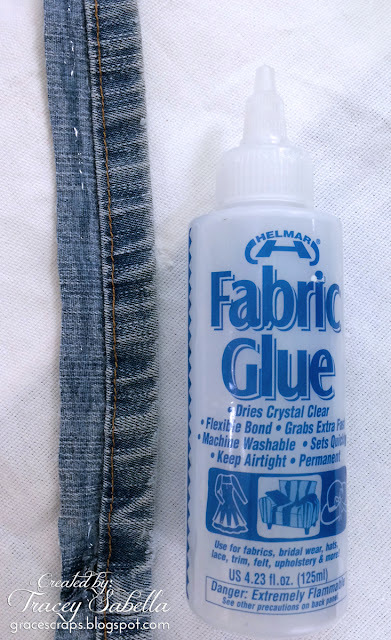 The handle for my piece is constructed from the hem of a pair of old worn jeans. I cut off the hem with a nice margin to fold over the back. I simply glued it down using Helmar Fabric Glue. 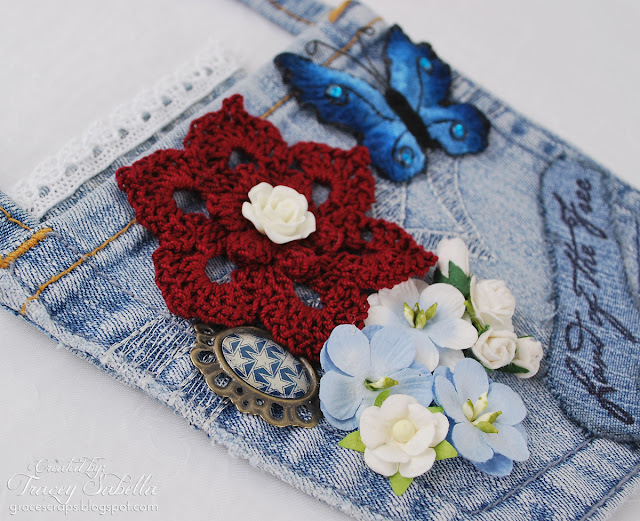 I cut out this denim pocket to use as my decorative base. 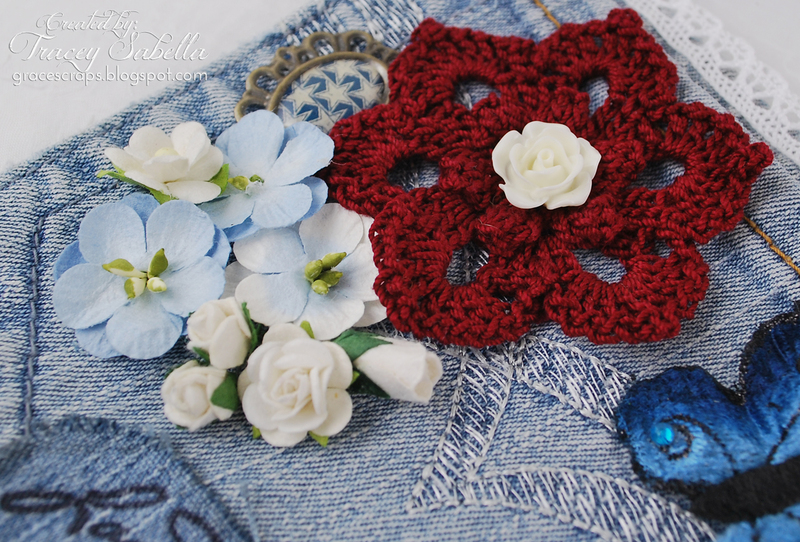 All of the elements are glued down with Helmar Fabric Glue as shown on this lovely red crocheted flower. The 4th of July is all about the Red, White, and Blue!! Colors that aren't always associated with a shabby chic pallete. 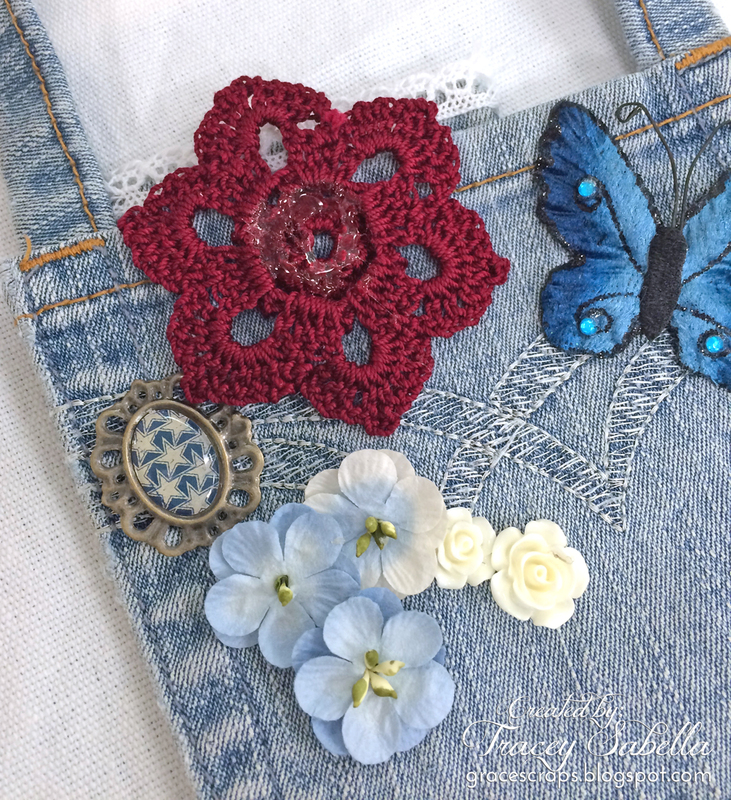 I dug through my stash and found some perfect elements to pair up with the denim pocket, from an older BoBunny trinket to a new Tim Holtz resin flower, all adhered with Helmar Fabric Glue. Here's a shot from another angle. I've never attempted to stamp on denim, but as you probably have figured out, that has never stopped me from trying. I used Ranger Archival Ink and achieved a perfect image on the first attempt. I cut it out and distressed the edges with the edge of my scissors and rubbed Black Soot Distress ink into the rough edges. The Helmar Fabric Glue holds it on smoothly without any lumps or bumps. One final view. The handles are also adhered with Helmar Fabric Glue. 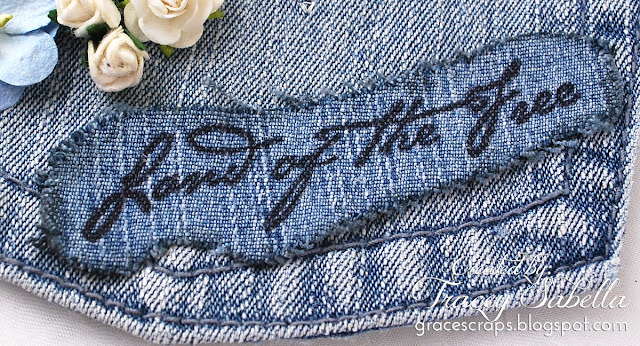 jeans and create a no-sew home decor project. Please stop by my blog for a complete product listing HERE. OK, so I know that most normal people make tiny Fairy houses, but not me! I made a huge Fairy Lodge for all the little fairies to come to on vacation! lol What can I say? I've never been normal!! First I made lots of fun things to embellish the front of the yard with, like a tiny birdbath made from a seashell, acorn mushrooms and a little Fairy stand for them to store their magic wands in. The ladder was so much fun to make. Now you may be asking, why do fairies need a ladder since they can fly, well they don't...but the Gnomes like to visit and they need to climb up so they can visit...wink, wink. Evidently fairies like glitter too, so I added tons of it and a little moss here and there to hide the glue that sometimes showed through. Then, I went to work on the Fairy Creek Lodge out down by the creek where it was nice and cool. Other than keeping an eye out for snakes, it was awesome and I loved working outside. I added tons of pine cones and moss on the top of the roof along with a few pebbles and twigs. I then returned back inside to create my Fairy door....there are a lot of premade Fairy embellishments you can buy, but it's more fun to create your own! I found a nice piece of tree bark and cut it on an angle (because evidently Fairy doors are all shaped) and used Helmar 450 Quick Dry Adhesive to adhere it to a piece of cardboard and then glued a branch (that I found with all the bark removed already and it's very hard, almost petrified) to surround the door. Love the little bell that I had hoarded for years, it was the perfect addition to add to a piece of wild grapevine for the front door, the bell even rings.....oh it is that cute!! Then back down to the creek to work on the front of the lodge. Helmar Silicone Adhesive Sealant is the BEST way to go when making anything for the outdoors, especially when working on difficult surfaces. You can see how the glue fills in between any spaces left by the twigs and fills up the curved area from the tree bark. This glue ROCKS uneven surfaces better than anything! As you can see, I had many different surfaces, twigs, lichen, small stones and tree bark all to apply on to a standing surface. I love, love LOVE how the right glue can make a difficult project easy! And let me point out a few things, I was working down by the creek where everything was pretty much damp, even the pebbles I glued on were wet....and they stuck to the front like magic! Also, several times while making this I was chased out by rainstorms, hard rain too and nothing washed off! The glue wasn't even cured and it held up in rain. Can we say simply amazing? And if you haven't figured it out by now, the reason it's called Creek Fairy Lodge is because I have it perched on the creek bank. Go out and create a little fairy magic of your own with the help of Helmar Worldwide Adhesives! Hello! Martice here, sharing a really fun way to illustrate your favorite quote. Don't ya just LOVE displaying inspirational posters around your workspace + studio? I know! So do I! Well, you're in for a treat today because I'm sharing my step-by-step on how to create an eye-catching illustration that encourages you to go after your biggest, most wildest dreams. 1) Loosely paint a journal page with black gesso using the 3/4 angular paintbrush. Let dry. 2) Using a #3 round brush and white acrylic, paint your inspirational quote. Take your time with this step! If you make a mistake, wait until paint is dry then brush black gesso over it. 3) Take your pencil and draw flowers, vines, and other botanicals as a border for the illustrated quote. 4) Create small marks along the outline of some of the petals with a white Gelly Roll pen. 5) I love adding dimensional elements so, next, I applied Helmar Liquid Scrap Dots to the middle of the flowers, then brushed on a layer of green interference paint. (This special kind of paint makes a great effect and it's so beautiful when light reflects off of it.) The illustration is looking a bit magical now! 6) I used a sharp X-Acto knife to cut out two birds from a thin, cardboard package. 7) Spread a generous amount of Decoupage & Craft Paste onto the cardboard, then sprinkled on blue glitter. 8) To set the glitter in place and prevent it from smearing off, spray two light coats of Helmar Crystal Kote Gloss Varnish and allow to dry before handling. While the bird pieces were drying, I continued embellishing my illustrated quote. 9) I outlined the petals with an irRESISTible Neon Pico Embellisher in white (ImagineCrafts). When this dries, the lines will have a subtle, textural feel. Ooo la laa! 10) Select areas within the petals to brush on more of the green interference paint. Outline the flowers with a mixture of acrylic + interference paints. 11) Once the bird pieces are dry to the touch, I determined where I wanted to place them within the composition. I added a small piece of matboard under each bird to make them lift from the surface of the page. Greetings fellow crafters from deep in the heart of Texas! This is a picture of my daughter shortly after having her braces removed. Isn't that smile "AMAZING"! Have you ever wanted to try your hand at creating a work of art on canvas but didn't really want to invest in buying one? Here is a simple cost effective way to create to your hearts content! After you cut your cardboard to size squirt a generous amount of Helmar Super-Tac Glue and spread it out evenly. You can use an old credit for this is you have one. Place pre cut fabric on top and smooth it out from the center to outer edges. Let dry. Now that you have your canvas apply a coat of gesso and allow it to dry. Then I applied a top coat of white acrylic paint. These two steps will keep your paints from bleeding into the material. Now to create some texture by applying a stencil and paste. Allow to dry. Now it's time to play with paints and mists of choice. Place your photo where you like on your canvas. I use a bit of Helmar Craft & Hobby PVA Glue to a square of card board and adhere my photo to it for a touch of height. Finally I rummage through my stash for a few flowers and other elements to create interest and flow to my canvas. I hope this has inspired you to allow your own creativity to take flight. Don't forget, whatever project you create always start with Helmar glues! Helmar products used on this project. This month is crazy with the amount of birthdays in my family and with the youth I work with at church. I've been whipping out the gift bags left and right. I pulled out some of my card stock scraps to help decorate this simple Happy Birthday bag for the birthday girl this week. I started by cutting the base of the bag out with my Cameo. I cut a piece of card stock that was slightly larger than the opening in the bag. Here is where those card stock scraps come in. Using Helmar Acid Free Glue I started gluing the card stock onto the white card stock. Once all the card stock has been glued down simple use a pair of scissors and cut around the base card stock. Glue this behind the happy birthday opening in the gift bag and put the bag together with Helmar 450 Quick Dry Adhesive. As a finishing touch I outlined the cut out design with a fine black marker. Once finished I decided to put together a card using the same technique and used a heart punch once the strips were glued down. The card came together really quick once the hearts were finished. Here is the finished duo. I know the birthday girl will love the bright colors of both the card and the bag. Greeting, crafters! Jennifer, here, with a fun weekend project for anyone in your life who loves dolls! It's amazing what you can do with an empty box and some packing material--with the right glue! Inspired by a couple of MyFroggyStuff videos (Secret Garden and Water Fountain), I started with a 14"x14"x28" packing box left over from our move, removed the top flaps and most of one of the big sides, and covered the cut edges with strips of computer paper and Helmar Craft & Hobby PVA Glue. Then I used bits of pressed cardboard (the molded type you find around small appliances) to simulate stones for the beginning of my fountain area, all glued down with more Helmar Craft &Hobby PVA Glue before painting it. The molded cardboard gives a natural texture to this sort of project, adding a dose of realism to our miniature scene. After fashioning a semi-circular enclosure for the fountain out of spare cardboard I used the same technique to cover it as well as the shape I sketched out for the back wall of our fountain. The fountain is constructed of upcycled bottle tops and plastic bottle parts (the tulip-shaped top of the fountain is the neck of a Simply Lemonade bottle!) held together with Helmar Craft & Hobby PVA Glue and a bit of Helmar Liquid Scrap Dots for the more fiddly connections. When you work in miniature, it's the little details that really sell the scene. To camouflage the box's front edges I cut down an empty wrapping paper tube to make columns, gluing thin strips of card stock along the length to give the impression, once painted, of sculpted ridges. A bit of scale-appropriate greenery wired to the sides of the box (with printed scrapbook paper behind it to fill in any gaps) and it's ready for play and display! Good morning everyone, Steph Ackerman here to share how easy it is to create cards with the help of Helmar adhesives. Using my Scor-Pal, I scored 6" x 12" cardstock to create 6" square cards. Then, using Helmar Premium Craft Glue I applied it directly to the panel. Using the handy Helmar spatula, I quickly smoothed out the adhesive, then adhered the panel to the card. I was so excited to see a smooth finish - no lumps and bumps you sometimes get when using liquid adhesives. And while the drying time is very fast, you do have a little wiggle room if you put the panel on crooked (as I did). I used the same adhesive to adhere the flowers. And as I wanted to add some bling, I used Helmar Gemstone Glue to adhere the gems randomly to the card. The sentiment was nestled amongst the flowers with a touch of Helmar Premium Craft Glue to hold it in place. I used the same adhesives on this card, and again, I achieved a very smooth finish on the pattern paper as well as the cardstock. Finally, I tied ribbon around the panel, held it in place with Helmar Premium Craft Glue and adhered it to the card. Hi, Veronica here today to share with you a mixed media/cutesy Father's Day tag. 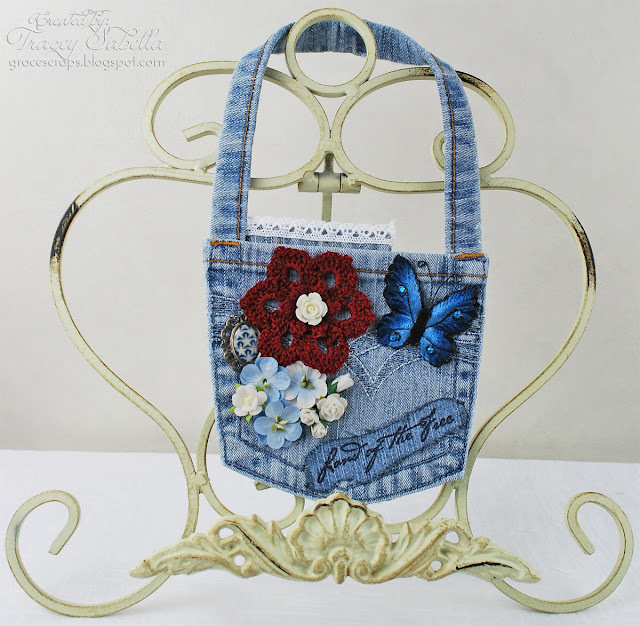 So there is such a thing as a cutesy mixed media project? Of course there is, and I make them all the time. Do not be intimidated by the word "mixed media" it does not have to be an image of a human body with a bird head - sure you have inks, sprays, stencils, tearing but it can also look cute. Start: Gathered all my supplies - by putting together a Father's Day theme (in this case words) and some matching colors. I used my Ranger Distress Inks and some Tattered Angels spray for my base tag. I used my Helmar 450 Quick Dry Adhesive to layer my pattern papers and cut out the tag. Once my layering is done, I start arranging my embellishments to see where they look best. For adhering my leaves, flowers and very cute owl button I chose to use the Zap Dots Clear Round 1/2 inch pack. These little round dots have a slight 3D lift to them. Thank you for stopping by today. I wish you and yours a Happy Father's Day. I hope you all give Helmar Adhesives a try. Hi I am Sharon. June has arrived and it is the perfect time to be outside and create. You can make your own little travel journal . I started with watercolor paper and cut to the size of the chipboard cover. 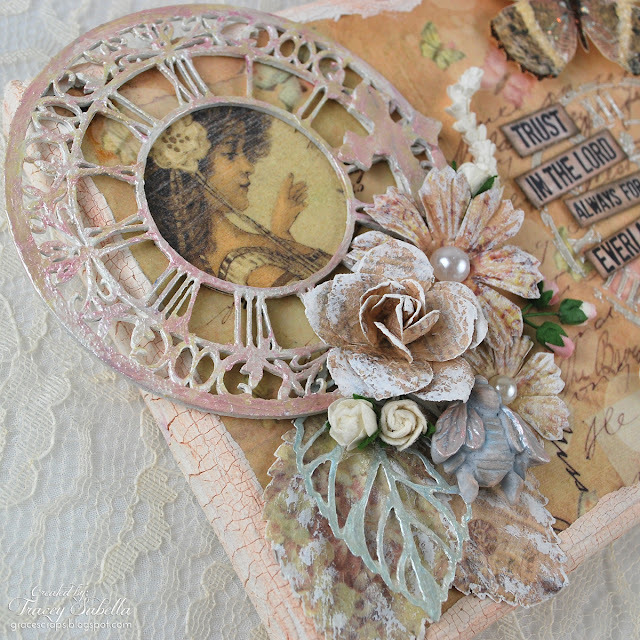 I use my scrapbook paper scraps to cover the chipboard . I used the Helmar Decoupage & Craft Paste and the handy little plastic tool. I love the smoothness of applying this glue and the paddle was great for spreading it where it needed to applied. I loved this product. This little red paddle is just the tool to use to apply and smooth the paper on top of the glue. No wrinkles or bubbles, it make really smooth surface to work on . This is the front cover of the Journal. I drilled holes in the chipboard and punched the holes in the watercolor paper fist. I used a stencil and crackle paste to make texture when it dried I used a mini mister and spayed colors on and wiped off with a babywipe or soft cloth. When it was dry I added the stamps to give it more texture and then dried and sprayed with the Helmar Crystal Kote Matte Varnish. The back of the journal was Decoupaged the same as the front cover. I left it just with the paper and added some stamps and little gold corners. 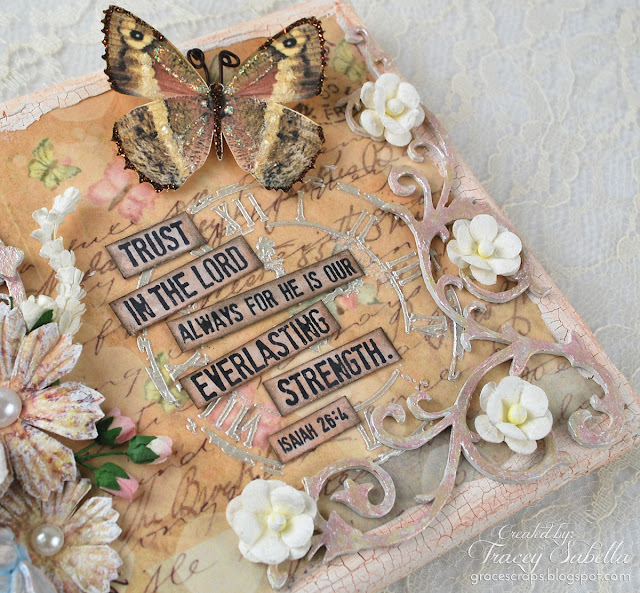 I finished this journal by adding the elements to the front cover after I spread the great Helmar Decoupage and craft paste. I just layed the elements where I wanted them and pressed them with my fingers and they are stuck.. The finished Travel Journal. 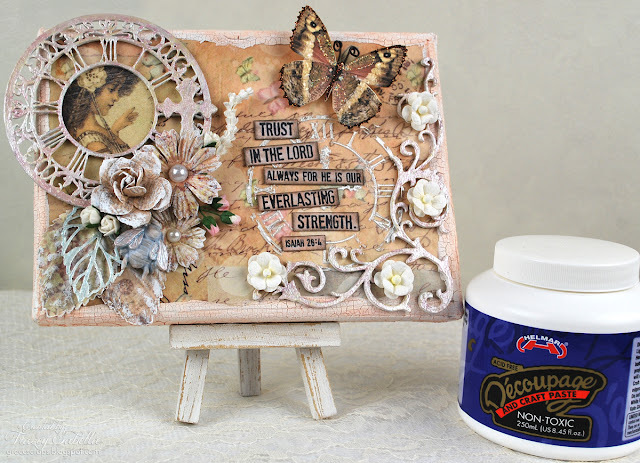 Size 4x6"
Hi Helmar fans, it's Tracey back to share a canvas with you featuring Helmar Découpage & Craft Paste. Birthdays are a special time to show appreciation, and I've created this canvas with an encouraging verse for a dear friend. She has a creative sweet soul and adores anything vintage. It can be tricky to adhere paper to canvas smoothly without wrinkles or bubbles. 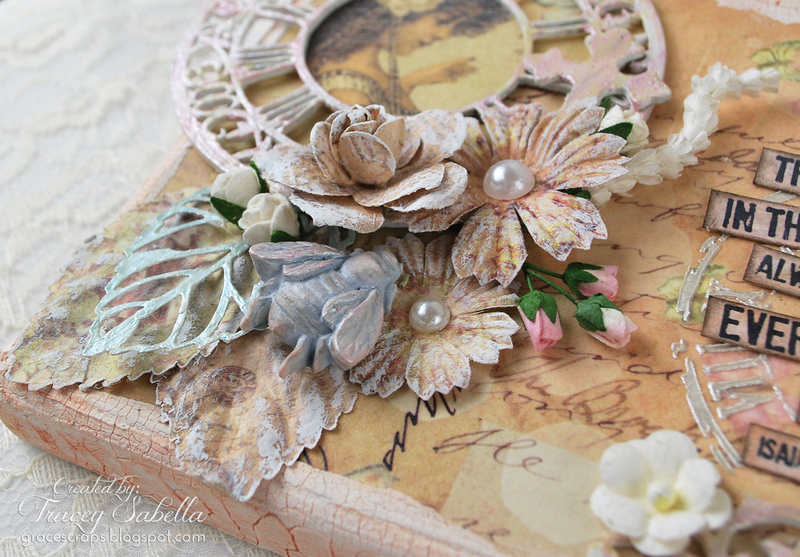 Helmar Découpage & Craft Paste worked perfectly for this application. The Découpage Paste is rather thick, so for my 5x7" canvas I put about three tablespoons or so of the paste on my craft mat and added water until it was a nice consistency to brush onto the canvas. I'm guessing about 1 part water to 2 parts Découpage Paste. I then used a foam brush to apply the paste onto the canvas, I also brushed it onto the back of my patterned paper. Finally I gave another quick brushing to the canvas to make sure there weren't any spots that had dried out. I put the paper in place and gently rubbed with my fingers to make sure there weren't any air bubbles. I set it aside to dry before continuing to decorate the canvas. I wanted to make sure everything was securely adhered so that all the elements will stay in place over the course of time since a canvas will be hung or displayed on an easel. Of course I grabbed my Helmar 450 Quick Dry Adhesive for this job. This is not a place where a little dab will do. I used generous amounts of adhesive. I didn't worry about adhering every little place on the clock chipboard, but rather focused on applying glue to the thicker outer rim and in places where the chipboard design was a bit thicker. Here's a close-up of the flower cluster. To allow for added dimension, I only adhered the leaves at the base. The skeleton leaf is a metal piece I colored with pearl medium and is actually floating above the other leaves. It's quite secure though with a generous dollop of Helmar 450 Quick Dry Adhesive at the base which is hidden by the other flowers clustered over the glued area. I stenciled the clock with a pearlized medium resulting in a slightly raised and uneven surface. I applied the stamped sentiment strips using Helmar Liquid Scrap Dots which allowed me to apply them over the textured surface without warping the strips. 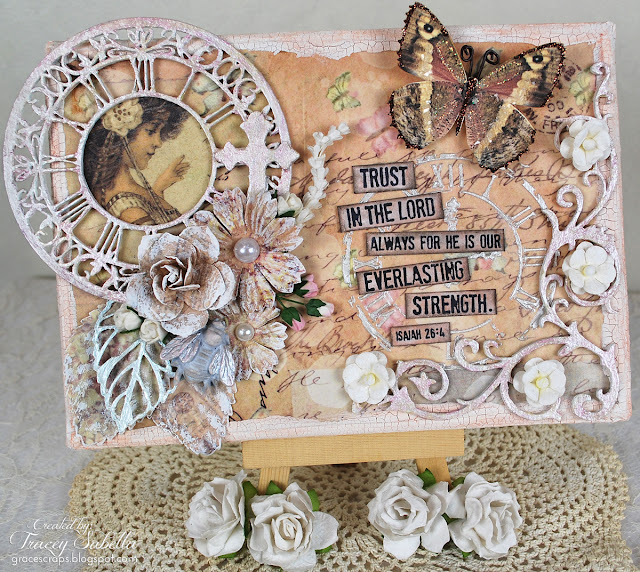 The butterfly, chipboard, and flowers are all adhered with Helmar 450 Quick Dry Adhesive. I hope you've been inspired to grab some Helmar Découpage & Craft Paste to use on your next canvas project.